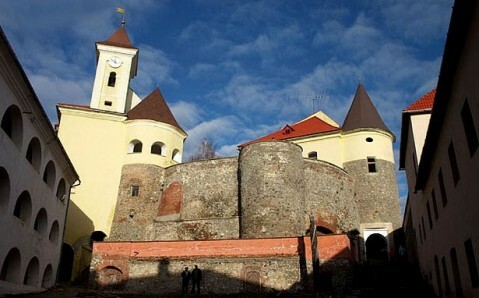 It is believed that Mukachevo castle was built in Kyivan Rus times. Back then it was a palisaded ('palanca' is Italian for 'palisade') wooden fortification, and from here derives its name. 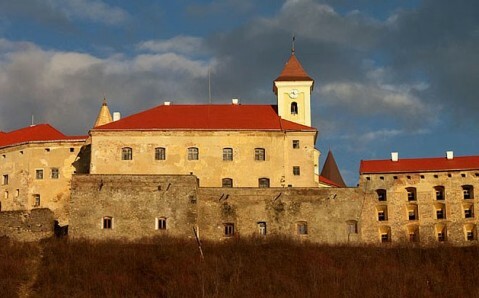 Palanok Castle became stone in the late 14th century, under ownership of Podillia Prince Fedir Koriatovych, who significantly rebuilt and updated the defensive complex. New walls were constructed, deep ditch was dug, additional towers were raised and dwelling houses were built. The later ones were connected with long narrow passages, one of which was called the trap, or corridor of death. If an enemy penetrated town and entered this passage, entrance and exit were blocked with metal gates, and boiled water and hot pitch were poured over the trapped enemy through the holes in ceiling. 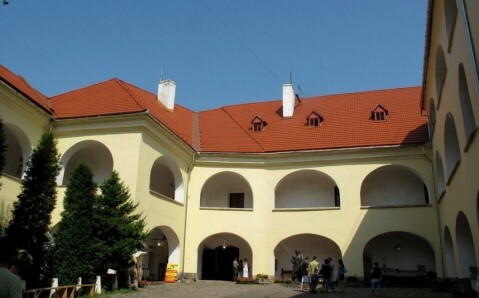 Under Koriatovych's ownership, Mukachevo castle's territory acquired one more remarkable item - 85-meter deep well, with which an interesting legend is connected. It was dug for a long time, but water failed to appear in it. Then, devil came to castle's owner and offered water in the well in exchange for a sack of gold. The prince was in financial straits and decided to use cunning: he gave the smallest sack with two coins to the devil. Vexed devil grabbed money and jumped into the well. It is said that his offended howl can be still heard from there. 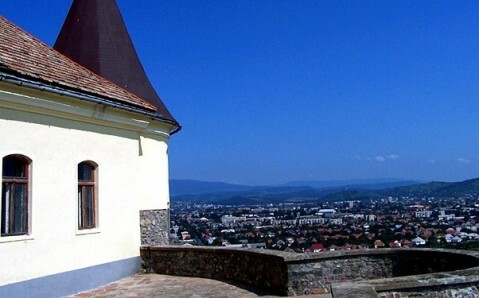 Since the 16th century, Austria and Transylvania constantly fought for Palanok Castle, and due to this it often changed its owners. In the year 1633, it passed to Transylvanian Prince Dyerd Rakocziy, who turned the Mukachevo fortress in the centre of his princedom. Under his rule, defensive facilities were actively renewed and rebuilt. Old or, Upper Castle was reconstructed, and two more castles - Middle and Lower - were built near it. After prince's death, his widow Sophia Batori assumed the power. Under her rule, two defensive terraces and outer defensive ring were built. By the way, the princess was one of the Palanok's most striking rulers and became famous for her extreme cruelty. She is said to have drunk human blood and bathed in it in order to find eternal youth. 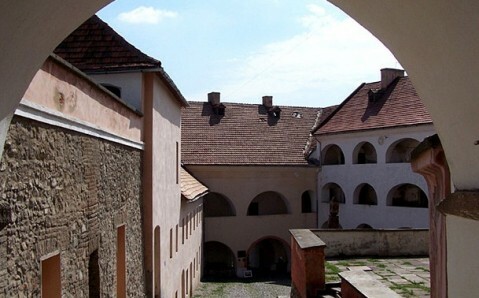 Mukachevo Castle's history is connected with the name of one more woman - Ilona Zrini, Sophia Batori's daughter-in-law. Contrary to her mother-in-law, she became famous for extraordinary courage, which she showed during repulsing Austrian troops' attack on the castle. The siege lasted two and a half years and Ilona Zrini led fortress garrison the whole time. But after all the castle was taken by the enemy: Austrians tricked Ilona Zrini into signing instrument of surrender. By the late 18th century Palanok Castle lost its strategic meaning. Soon political prison of Austrian monarchy was opened here. It existed somewhat longer than a hundred years and then the castle was abandoned for a long time. 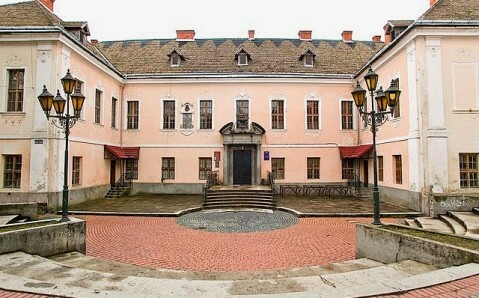 Since 1989, castle premises are occupied by Mukachevo History Museum, where over ten interesting expositions are shown. The picture gallery featuring the best canvases by west-Ukrainian painters and ancient icons is also located here. 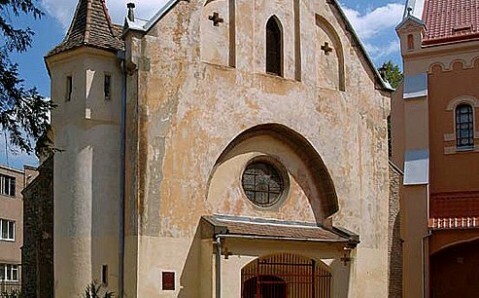 Some Palanok's halls are allocated to the exhibition "Wooden Churches of Zakarpattia" and artistic salon, where one can buy local artists' pictures and souvenirs. 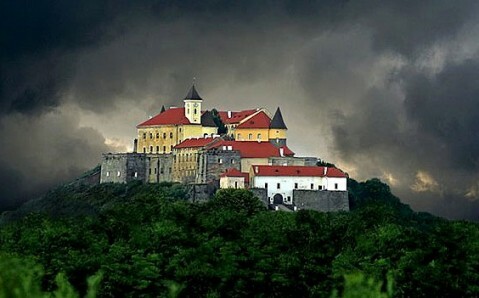 There are also cozy coffee houses on the fortress's territory, where it is pleasant to drink a cup of fragrant coffee and admire castle's sceneries. 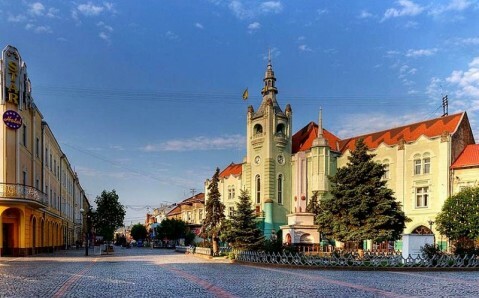 Amazing view on Mukachevo, beautiful interior. Great site, local artists, cheap tours. They do weddings! Cheap and interesting, guides very knowledgeable, doubtful they speak English. History, art, culture. Local artists sell wares cheap. Величественный, непреступный. Пять баллов экскурсоводу Андрею. Очень познавательно. Як на мене, то найкращий замок України. Я був від нього в захваті! Сам по собі замок цікавий лише перші 20 хв. Обов'язково запросіть місцевого гіда - честь замку тримається на історіях понад 1000 років тому. Чарівге місце. На територіх окрім музик та сувенірів є дегустація вин у групах більше 5. Вартує! It's beautiful castle! It's medium age! Очень понравилась экскурсия. Экскурсовод молодой парень Андрей. Вид с верхнего замка отличный. Не витрачайте час на Схiдний Бастioн, там нiчого нема. Один из лучших сохранов из всех замков Украины! Классное место, есть что посмотреть. Но поработать над ним нужно. Убрать торговцев китайскими магнитов в первую очередь. Неплохо было бы нарядить персонал в соответствующие наряды. Снизу виден один из двух в Закарпатье турул - древний мадьярский тотем, свирепый орёл с распростёртыми крыльями, памятник 1000-летию перехода мадьяр через Карпаты (1896). По дороге к замку активно торгуют домашним вином. Хорошая обувь - залог удачной экскурсии. Если вы без группы, то присоеденитесь и прослушайте интереснейшюю историю от экскурсоводов. Watch the bagger kids at the entrance and car parking. They speak Hungarian and Ukrain, caiming HUF and UAH as much as you have. The museum doesn't worth it's money, but the castle does. Прекрасный панорамный вид на город из бастиона! В замке будто евроремонт. Сложно почувствовать в этом старину.